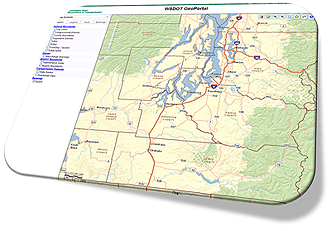 The WSDOT GeoPortal is an application that allows users to view WSDOT spatial data (like Functional Class, Interchange Drawings, City Limits and State Routes) via a web browser. Users can check a box to select from a variety of base maps and data layers. They can click on the map to return a State Route Mile Post value or type an address to zoom to. For first time users: There is a Help and Users Guide that will assist you in getting started with the application. You can also access this guide from the application’s Help tool. Share your map via a url link. and Maintenance Boundaries, Interchange Drawing Diagrams, State and Local Route Functional Class, Township/Section Boundaries, and more. Choose from a variety of basemaps including: Imagery, Topographic, Bing Maps Aerial, OpenStreetMap, WSDOT Basemap, and more. Use tools to locate a State Route Milepost, Zoom to a Latitude/Longitude coordinate, County, City, Urban Area, or street address. Find Route Location - now has the ability to 'locate a line' (previously 'Find Milepost'). Find Nearest Route Location - now shows 'offset' information (previously 'Find Nearest Milepost). Toggle Option - allows you toggle between different GeoPortal configurations from a drop down box within the application.